High up any traveller’s list should be the beautiful Northern Irish coastline. 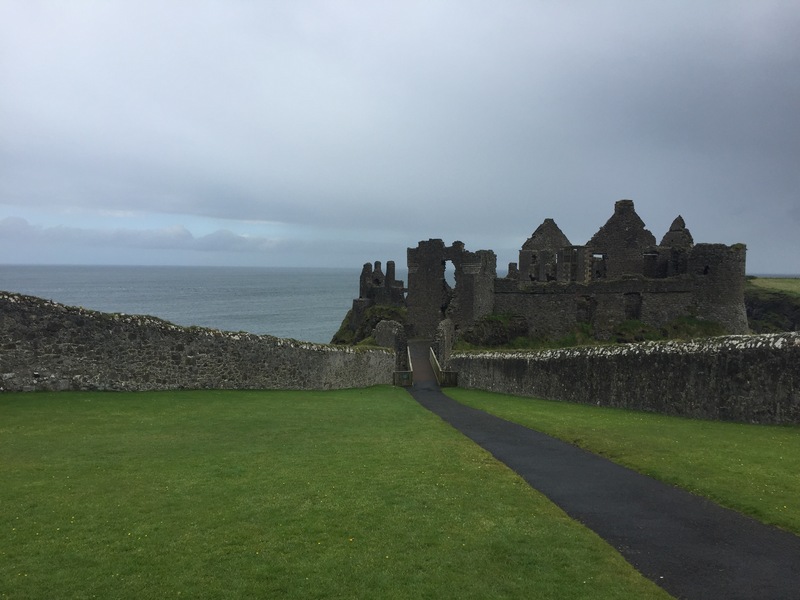 It’s peppered with the most gorgeous landmarks, many of which we were lucky enough to visit during our stay on the Emerald Isle. Although only a 10 minute drive apart, Dunluce Castle and The Giant’s Causeway have their own unique characters, and I’m hoping to be able to show a little bit of that to you here! 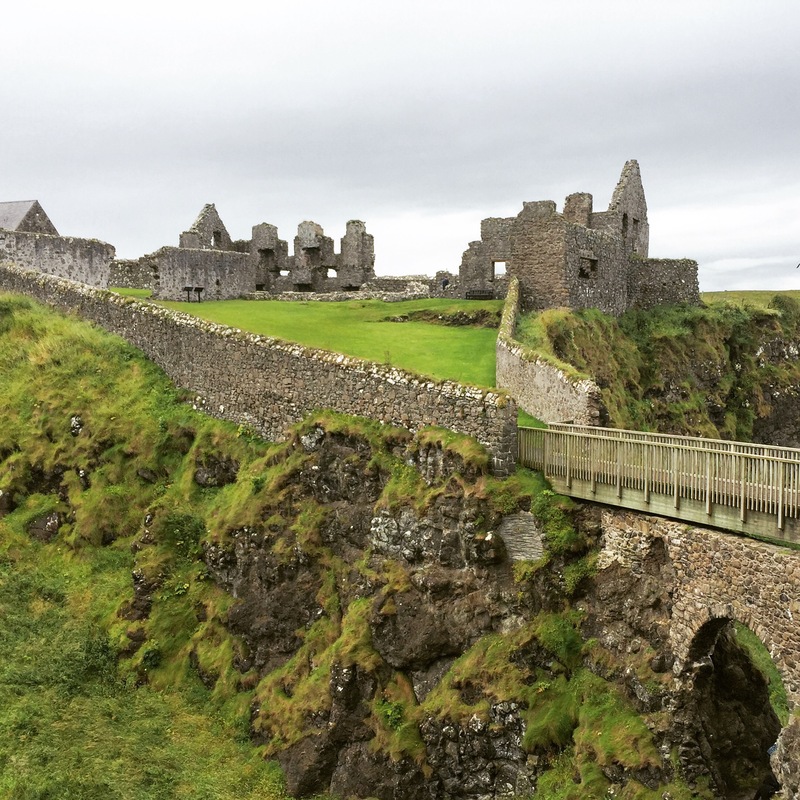 Dunluce is a ruined fortress, but probably the grandest ‘ruined’ thing I’ve ever come across. Its location on the cliff-edge, overlooking the Atlantic Ocean, is incredible, as if straight out of the pages of a novel. It’s a wonder that it’s in such good shape having been constantly battered by the driving wind and rain, as it was on our visit! Parking is in relatively short supply, but almost as close to the castle as you could get. 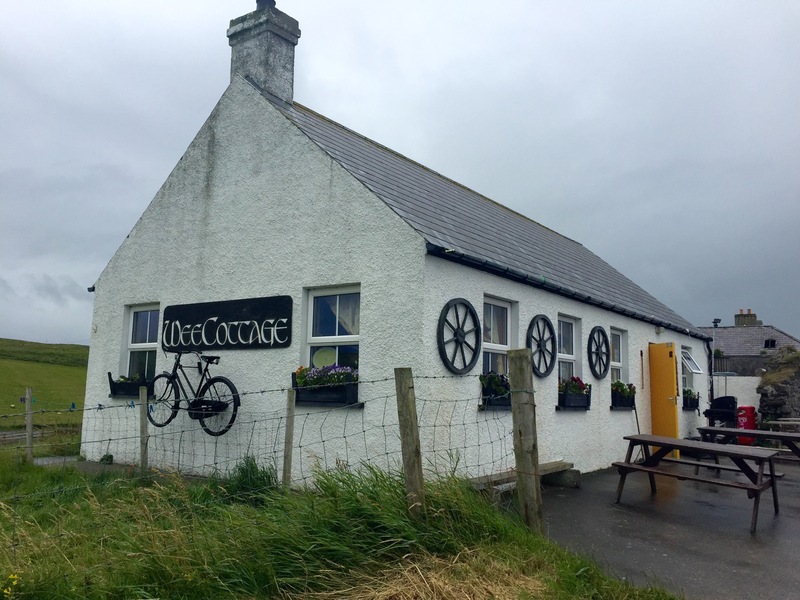 There’s also the lovely Wee Cottage cafe just next to the car park, which is the perfect place to stop for a coffee before or after a wander around the ruins. This might not seem like a big deal to some, but for the cafe aficionados amongst you, they do Chai Lattes there. You can thank me later. There is an entry fee for the castle, but with so much to see and learn, you’ll soon forget about the small charge. It’s atmospheric, rich in history, beautiful, a little bit haunting and unbelievably windy. Prepare to be windswept and/or as interesting as usual. It’s probably fair to say that no matter how busy Dunluce is or how crowded its little car park becomes, the Giant’s Causeway will almost always be heaving with people. While this isn’t ideal for the shutterbugs or Instagrammers out there, it’s testament to how well set-up this National Trust site is for visitors. There’s an imposing visitor centre complete with restaurant, shop and educational area, which leads through to the road down to the main attraction. It’s a 15-20 minute walk to the Causeway, but there’s also a shuttle bus. However, although the walk back uphill is steep, the shuttle buses aren’t all that frequent, and so they’re filled up straight away when they do arrive. Whichever way you choose to make your way to the Giant’s Causeway, the scene is still absolutely beautiful when you get there. If you’re thinking I overdid it a bit with the photos, you should see how many were on my first edit! Although full of people, the beauty of the Causeway was still transfixing. It’s one of those things you need to see to believe, as even when you’re climbing over the hexagonal Basalt columns, it’s still hard to believe that they’re an amazing product of nature. In terms of climbing over the columns, sensible footwear is definitely advised. You may even find that your trainers accidentally match the Causeway… Stay tuned for the next Northern Ireland installment!